Some of us who dealt with the Kansas City Prophets (hereafter knows as KCP in this report) in the 80's and 90's might think this report and the others associated with it are very much out of date and unnecessary now that the "prophets" have moved on and the church where they began their work has changed into Metro Christian Fellowship (formerly Grace Fellowship). Quite the contrary! While the KCP episode may be long gone in itself, it's now necessary to bring their doctrines to light once more, because the doctrines that are so very widespread and popular within the revival churches - indeed, central to the whole apostasy - were brought into prominence at that time. They have since grown to massive proportions and account for many seemingly inexplicable practises like impartation, the glory cloud, birthing, the inner room experience, spiritual levels, the overcomers, Joshua generation, Joel's Army, Saul and David, Ishmael and Isaac, the Jezebel spirit, school of the prophets, tabernacle of David, city church and much more. Prophets who were hosted by Mike Bickle such as Paul Cain, Bob Jones, Rick Joyner, and John Paul Jackson have gone on to take a leading role in the formation of the New Apostolic Church. I had already given a short summary of events in my separate article on IHOP - International Houses of Prayer, or the Harp and Bowl prayer initiative, which started out with Metro Fellowship. To that I have added several reports written at the time by such ministries as CRI and PFO - these will outline the history and sequence of events - and even more importantly the entire 233-page report by Ernie Gruen that circulated to thousands of pastors in an attempt to show them what was really going on at Grace ministries with the KCP. More importantly, I have added an eye-witness testimony of events from a former member of Grace Fellowship/Metro City Fellowship who spent eight years there during the era of the KCP. Begin reading this testimony HERE; and follow the links within each article for the subsequent parts. The above testimony and open letter to the current eldership will bring us up to date with the situation and show how the errors were never dealt with but only denied and swept under the carpet, while the doctrines and practises of the KCP got out into the wild and infected the Church as a whole. 1982 The Kansas City Fellowship founded by Mike Bickle after he received a prophecy and heard an audible voice in Cairo, Egypt telling him to "raise up a work that will touch the ends of the earth". 1982 Meanwhile Wimber discovers the power and manifestations of "the spirit" largely through Lonnie Frisbee, a former drug-taking hippie. Wimber's interest in "the miraculous" escalates. 1982 (May) Calvary Chapel renamed Vineyard Christian Fellowship and in 1983 it moved to Anaheim, California. Wimber and C. Peter Wagner launch their controversial course, MC510 - "The Miraculous and Church Growth" at Fuller Theological Seminary. This course included hands on "training" in signs, wonders and, healings etc. 1983 Bob Jones arrives at KCP. 1983 (May 7th) the famous 21-day fast called for; Bob Jones announced a three-month drought in confirmation. Despite all this, nothing happens to launch the massive move of God Jones has predicted. 1984 Jones gives the Civil War and the Bulter-Baker prophecies, supposedly predicting the Toronto Blessing ten years later. 1985 John Paul Jackson joins the team at KCF. 1986 KCF founders and elders have formed Grace Ministries, an umbrella organisation designed to facilitate the emergence of a "new breed" into the church -- end-time prophets. These ministries immediately came under fire in the Kansas City area due to the teachings of KCF pastor Bickle, and the ministerial team which included Jones, Jackson, David Parker, Jim Goll, Francis Frangipane and Reuven Doran. 1987 Birmingham, Alabama: Cain meets with Mike Bickle and several of his colleagues from the Kansas City Fellowship. 1987 Paul Cain joins the leadership circle, adopted as a leading prophet of the group. Michael Sullivant also joins KCF. 1988 (October) On a trip to Scotland, Bickle convinces Wimber to change emphasis of Vineyard to that of a prophetic ministry. 1989 (January) Cain meets with the Vineyard leadership in Anaheim, California, including Jack Deere and John Wimber, confirmed to Wimber by supposed signs such as earthquakes. 1990 Ernie Gruen (Full Faith Church of Love, Shawnee, Kansas), one of the fathers of the charismatic movement in Kansas City, releases a tape of his sermon "Do We Keep Smiling and Say Nothing?" accusing KCF of sending out false prophets, of "prophesying" area churches would close down (and then join KCF), and of outright lying. He also releases his 233-page document to Christian leaders across America listing other alleged abuses at the KCF. 1990 (January) shaken to the core by the public scandal caused by Gruen's expose, Bickle and the Kansas City Fellowship elders attempt damage limitation. They issue an open letter calling Gruen's report untruthful and negative, but say they are open to correction. 1990 (June) Bickle submits all KCP ministries to Vineyard covering. In return, Wimber issues some cautions and promises to rein in the worst activities of KCP. Paul Cain calls John Wimber his lifelong mentor and father and says he is "bonded to him for life". 1990 (June) Wimber, Gruen and Bickle meet to come to agreement on the problem. Gruen promises to stop circulating his report, but stands by its allegations. 1990 (July) UK evangelical leadership including the EA sign a statement expressing their support for KCP and saying "we have no doubt about the validity of their ministry". 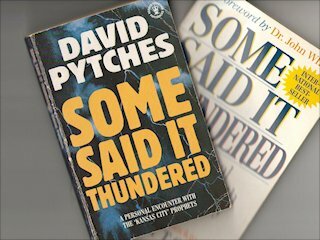 1990 UK charismatic leader David Pytches writes a book about his involvement with the KCP, "Some Said It Thundered", highly recommending their ministry. 1991 Grace Fellowship incorporated into the Vineyard as the Kansas City Metro Vineyard Fellowship. Wimber takes the KCP on a world tour and promotes the "prophets" worldwide under the umbrella of the Vineyard Movement. 1991 (November) Bob Jones exposed in a sexual scandal and removed from public ministry by Vineyard/KCF. 1991-93 Cain courts English churches and joins Westminster Chapel, severing his "lifelong" bond with Wimber and calling Dr R. T. Kendall his new soul-mate. Kendall says Cain is a "24-carat man of God". 1993 (October) The Word and The Spirit meetings at Wembley, England with R. T. Kendall and Paul Cain. Their book "The Word and The Spirit" released 1996 in an attempt to launch a union between charismatic and reformed evangelical church traditions. 1994 (January) Toronto Blessing breaks out at Toronto Vineyard (as it was then) and is vigorously supported by Metro Vineyard. 1995 (June) Public meeting between Gruen and Bickle finally heals public rift between them. "All issues are now resolved". 1995 John Arnott of the Toronto Airport Vineyard (as it was then) visits Kansas. 1996 Wimber forced to take steps to resolve ongoing criticism about the Toronto Blessing. Toronto Vineyard disfellowshipped. Mike Bickle takes his group out of the covering of Vineyard. They become Metro Christian Fellowship. 1996 (September) Paul Cain prophesies to John and Carol Arnott: The Lord has initiated the Toronto Blessing, not man...He has refreshed His people in order to prepare them for the next level of visitation.... Cain calls on the Kansas fellowship to return to its prophetic roots. 1997 (November) Wimber dies of a brain tumour. Some in the revival imply this is a judgement on him for his criticism of Toronto. 1997 Paul Cain moves to Kansas City to make the church his home church; he starts the Shiloh Retreat Center. 1999 (September) International Houses of Prayer (IHOP) started by Bickle and Grace Ministries on the Tabernacle of David model. 2000 (Jan) Mike Bickle hands over senior pastorship of Metro Christian Fellowship to Floyd McClung, former YWAM international director, in order to concentrate on his vision for the IHOP and other Shiloh Ministries. Extensive History of the Revival and Toronto Blessing; in four parts, starts here.